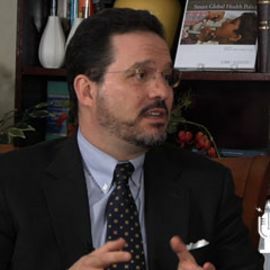 Michael Green is a senior vice president for Asia and holds the Japan Chair at CSIS, as well as being an associate professor of international relations at Georgetown University. He previously served as special assistant to the president for national security affairs and senior director for Asian affairs at the National Security Council (NSC), from January 2004 to December 2005, after joining the NSC in April 2001 as director of Asian affairs with responsibility for Japan, Korea, and Australia/New Zealand. His current research and writing is focused on Asian regional architecture, Japanese politics, U.S. foreign policy history, the Korean peninsula, Tibet, Burma, and U.S.-India relations. Dr. Green speaks fluent Japanese and spent over five years in Japan working as a staff member of the National Diet, as a journalist for Japanese and American newspapers, and as a consultant for U.S. business. He has also been on the faculty of the Johns Hopkins School of Advanced International Studies (SAIS), a fellow at the Council on Foreign Relations, a staff member at the Institute for Defense Analyses, and a senior adviser to the Office of Asia-Pacific Affairs in the Office of the Secretary of Defense. He graduated from Kenyon College with highest honors in history in 1983 and received his M.A. from Johns Hopkins SAIS in 1987 and his Ph.D. in 1994. He also did graduate work at Tokyo University as a Fulbright fellow and at the Massachusetts Institute of Technology as a research associate of the MIT-Japan Program. He is a member of the Council on Foreign Relations, the International Institute for Strategic Studies, and the Aspen Strategy Group. He is also vice chair of the congressionally mandated Japan-U.S. Friendship Commission and serves on the advisory boards of the Center for a New American Security and Australian American Leadership Dialogue and the editorial board of The Washington Quarterly.